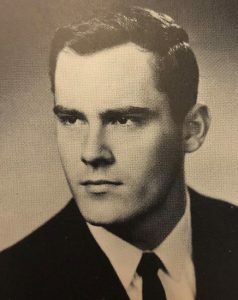 After a weekend spent reminiscing and celebrating with former classmates, Elmer F. Brunsman, FCRH ’63, died in O’Hare Hall, where he was staying for Jubilee Weekend. He was 77 years old. Not only did Brunsman organize a presentation at Jubilee this year, but he had organized a panel plus an exhibition of class ephemera for Jubilee 2013, when the Class of 1963 celebrated their Golden Jubilee. Described as the “beating heart” of his class, Brunsman’s passion for Fordham sprung from his experience as editor-in-chief of The Ram and as a member of the Fordham Club, said John Sexton, Ph.D., FCRH ’63, president emeritus of New York University. “There were a lot of smart people in that class, but he was smart in a way that was special, dedicated to what I call the common principle of the community of Fordham,” Sexton said. Sexton said Brunsman was “always his own person,” comparing him to the eccentric and brilliant character of Doc from the movie Back to the Future. Indeed, even up to his last days, Brunsman was deeply involved with the University, calling on staff from Development and University Relations to fine tune text and design of the report he was presenting, to say nothing of seating arrangements. Brunsman was no less passionate in his endeavors outside of Fordham. He worked as a teacher in the Washingtonville and New Paltz school districts and held a host of other roles that shored up his reputation as an original Fordham personality. Brusman lived for 25 years in San Francisco, where he worked in talk radio, public relations, television, and, early on, as a ship’s clerk, before returning to New York to teach. Mark Neville, FCRH ’68, recalled working with Brunsman, known as Terry to close friends, on the San Francisco docks directing longshore gangs. On his final day on campus, Brunsman was seen taking dozens, if not hundreds, of photos; taking notes; and smiling broadly. Several saw him at Mass in the University Church and said he looked at peace. Sexton said he saw Brunsman “perambulate among the tables” at dinner.